TLDR: Disabled people are almost non-existent on government and stock-photos websites, and when they are represented, they are not represented as whole individuals, but are only showed for their disability. We crawled the internet and looked at more than 500 government websites from around the globe and what we found was shocking! While around 50% do show physically disabled people in images, only less than 4% have them on non-health and wellness related pages. Governments aren’t the only ones at fault here. 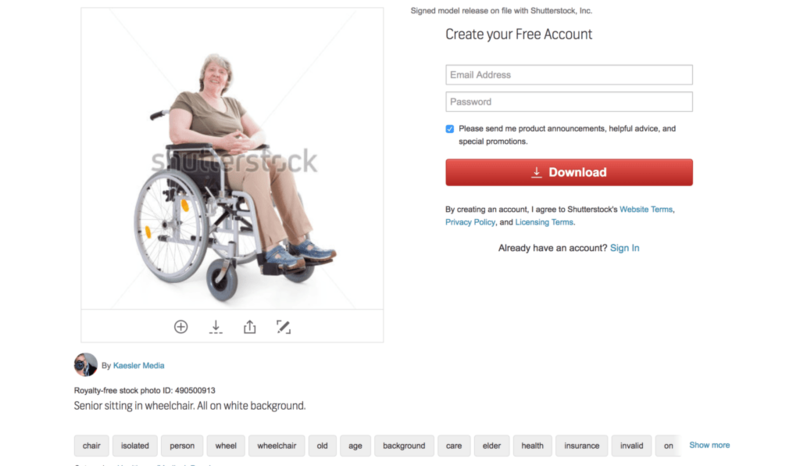 Stock photo websites, like Shutterstock, do not tag disabled people as actual people, but only for their disability. We call on governmental and stock photos websites to include disabled people and start treating as whole individuals, with varied lives and interests, and no to focus only on their disability. Disability is far from the taboo it was in previous centuries. Today, this valued section of society is afforded the same rights and concern as those who are physically able. However, when it comes to representation, the disabled community is still severely overlooked, and more often than not, all that is focused on is their disability. While they are “valued,” by focusing only on their disability, we hinder their full integration into society. Nowhere is this more prevalent than online; even on government websites – organizations responsible for ensuring equality – there is a significant lack of disabled people. Furthering our investigation, we also broke down where on the website disabled people appeared. Unfortunately, for the majority of the examples, they existed on health and medical pages, which once again pigeonholes the disabled and shuns them from complete social acceptance. The discovery that less than 4% of the pictures existed on non-medical pages was shocking in some ways, but you just have to browse a few sites to be faced with the reality of the situation. In other words, as far as government websites are concerned, disabled people exist only to further push medical conditions and concerns. Share ones and let more people know what is going on! Out of the 502 websites we explored, only a mere 24 showed photos of disabled people on non-medical pages. However, even these instances came with some notable issues. None of those found were on the website homepage. In fact, most existed in blog posts discussing a specific organization or person. For example, some Brazilian websites did include articles about the Paralympics. However, aside from pages about the Paralympics, there were no mentions or images of disabled individuals on the website. Even this shows the tendency to shun people with a disability by separating them into a different echelon of society. Glancing at these figures, you may assume it’s countries with lower economic status and reduced human rights that are guilty of this online prejudice against the disabled. However, the spread of the results tells a different story. No pattern exists that determines why the representation of the disabled is globally so low. However, as we explored numerous government departments for each place, it’s also important to note that no country showed ubiquitous inclusion. 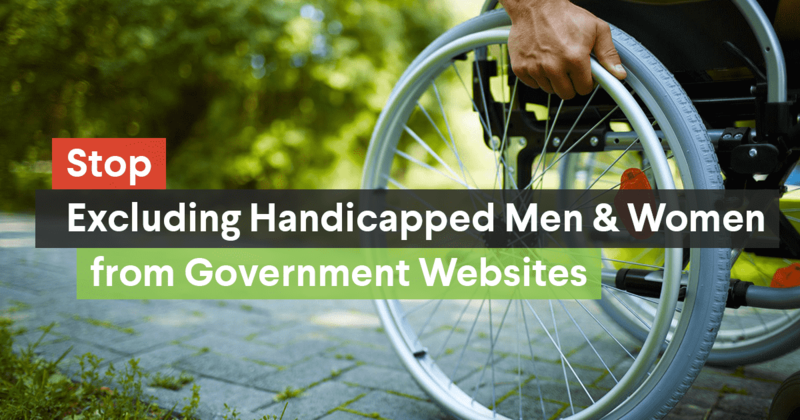 Though the US fared well on some sites, an alarming amount of official state websites included no photos of disabled citizens at all. The following were all guilty of marginalization: Texas, Alabama, Virginia, Michigan, Utah and many more. Other offenders included the Whitehouse website, plus Australia’s ‘my.gov’ domain and business website. Perhaps more worryingly, numerous countries failed to provide any representation on their official government site – including Taiwan, Slovakia, and even France. Considering some of these examples are members of the EU, this oversight is indefensible. After establishing the reality of this problem, the next step is that we must ask ‘why?’ Why is this clear exclusion of a vast segment of society occurring? Are governments acting out of sheer prejudice, or is there a more nuanced explanation? The answer may lie in marketing. State-run websites – like any websites – are powered by metrics. Webmasters tirelessly review stats to ensure their domain is reaching as many people as possible. Herein lies the potential problem when it comes to representation. It’s true that most countries have what can be described as a ‘social norm’ – a stereotyped idea of how the average citizen looks. When creating content that aims to resonate with a wide audience, it’s sensible to aim for this social majority. Whether this refers to race, hair color, size or – as in this case – abilities and disabilities, it’s a common problem that can quickly isolate those in minority groups. Somewhat similarly, disabled individuals could be left out of website photos thanks to the domain review process. 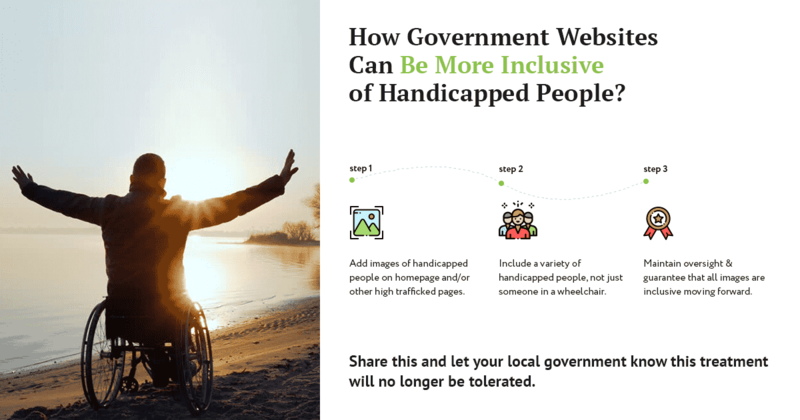 If government organizations perform A/B tests on their site, it may be the case that images of disabled individuals encourage fewer conversions and, therefore, reduce the perceived success of the web page. However, local authorities have a responsibility to their citizens. Eradicating representation for a large chunk of society is an inexcusable trade for improved website metrics. Governments globally have a responsibility to affect the public narrative. Arguing that there is no demand for better representation in images is superfluous, as it’s these decisions that dictate what society finds acceptable. Normalizing the use of diverse photographs, including individuals from all walks of life, is the only way to create an expectation for inclusion. Right now, we are so used to seeing a narrow representation on state websites that users aren’t even aware of the problem. The aim should be to create a demand for equal representation, not to bend to the systemic prejudices already in place. While governments have a responsibility to vet their websites for this problem properly, the fault doesn’t lie entirely with them. Most photos online come from stock photo sites such as Shutterstock. These domains offer royalty-free images that companies can use without fear of copyright infringement. The search features on these sites unintentionally dictate the aesthetics of most of the web. If pictures of disabled people don’t exist or aren’t tagged under the right keywords, then content creators won’t use them on their web pages. 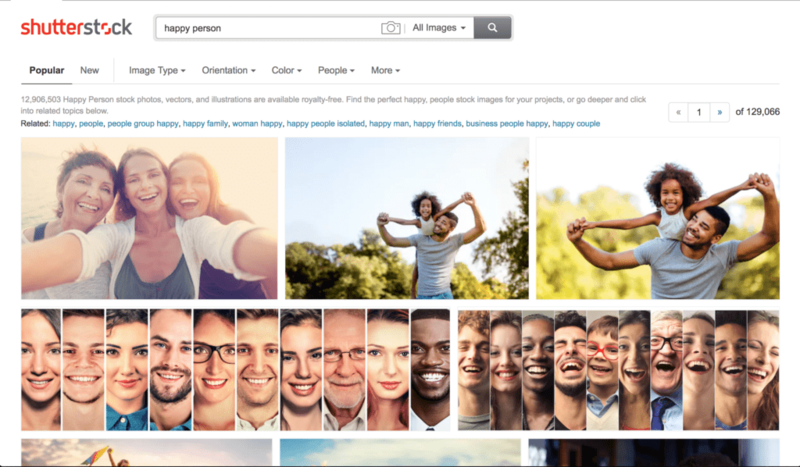 To test this theory, we searched a variety of different keywords – including ‘happy person,’ ‘person smiling,’ and ‘happy face.’ None of these popular tags featured photos of disabled individuals. However, a quick search of ‘person in wheelchair’ revealed that plenty of images of happy disabled people do exist – so what’s the problem? A quick review of the tags along the bottom quickly highlights the issue. Despite the fact this woman is happy and smiling, the keywords linked to the photo revolve solely around her disability and age. Because of this, the picture won’t ever show up in general searches and is unlikely to be used on non-medical web pages. She only exists as a medical condition. She’s only an older, disabled woman…an invalid even according to these tags! To further flesh this out, we wanted to do a test. We took eight popular stock photo sites and typed in “happy people.” We wanted to see how long it took for us to get to a picture of a happy disabled person. * Please note, if nothing was found past page 5, we stopped looking. No one really looks past page 5. *We’d like to note that for a majority of these photo stock websites, we saw images people of all ages, gender, religion, and races being represented. We even saw images of happy pets! *While you cannot always tell from an image if a person has a disability, for example – hearing impaired, there are many images where it is possible to differenciate between an able-bodied person and a non. It is the government’s job to have images that feature disabled people. This will also help the small boy who is hearing impared feel that they are being included because there IS someone with a disability featured, even if it isn’t their own. If we’re ever going to achieve equality online, resource catalogs like Shutterstock have just as much responsibility for changing the current prejudiced status quo. 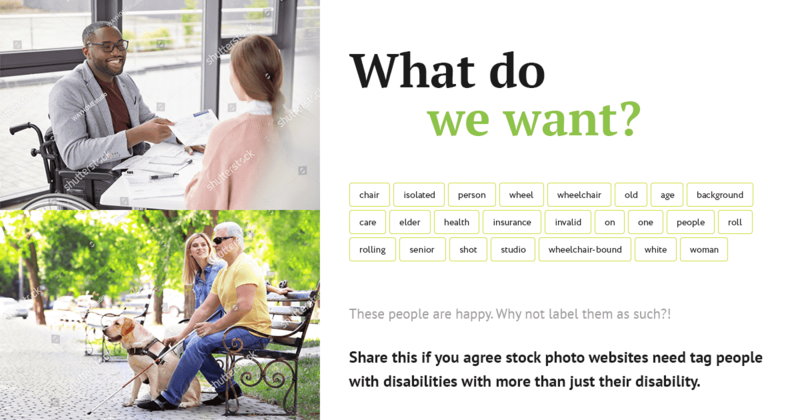 We urge all photo stock services to ensure disabled people are labeled properly and fairly. If they are happy, make sure to label them as such! The statistics regarding representation of the disabled on government websites are worrying, but the real issue is the scope of the problem. While liberal first-world countries still fail to provide visibility for disabled citizens, little hope exists in creating a universal solution. Ableism is rife in society, and while government organizations purport it, this unfair prejudice will never change. It’s easy to cast aside these issues a meaningless, but it’s undeniable that media has an incredible effect on how we see the world. Shunning valuable factors of society from these outlets is equally as destructive as excluding them in the real world. We have a responsibility to ensure disabled people, and other minorities, are given the visibility they deserve. Add an image that includes a person with a disability on the homepage or a heavily trafficked page. Do not just include people who are in a wheelchair, but also include the hearing impaired and blind. Maintain oversight to ensure men and women from all the different parts of the community are included. Let your local government know that this type of treatment will no longer be tolerated. In a world where we need to be inclusive of individuals from all walks of life, this can no longer continue. Share this article on Facebook, tweet it on Twitter – let other people know what is going on. Together we can put pressure on governments and stock photo websites to stop this online discrimination from continuing. Feel free to share and copy this post or parts of it to your site, blog, or social networks. All we ask is that you attribute it to us. We want to keep kids safe, and your help to spread the word is important. Did you enjoy this post? Was it useful? Then share it! Sarah is an experienced content writer and digital marketer. She is a well-versed online strategist and produces quality content to help others improve their website. Her expertise covers site development, social media promotion, SEO and content creation.